You can see Bao Bao in a month. Only one more month until IRL panda cub. Photograph courtesy National Zoo. After four months of gazing into a camera feed, giant panda fans will finally be able to see the National Zoo’s panda cub Bao Bao in person on January 18, the zoo announced today. Glimpses of the Bao Bao, whose name means “precious” (or, depending on how hungry you are, “steamed pork bun”), have only been available on the zoo’s vaunted Panda Cam or to famous celebrities like Hugh Jackman. Bao Bao’s appearance will also include the return to public view of her mother, Mei Xiang. However, the zoo is warning panting pandaholics that Mei Xiang and Bao Bao’s appearances will be contingent on their behavior. “In the first few weeks they may not be on exhibit for long periods of time; they will spend more time on exhibit as Bao Bao gets older,” the zoo writes in a press release. 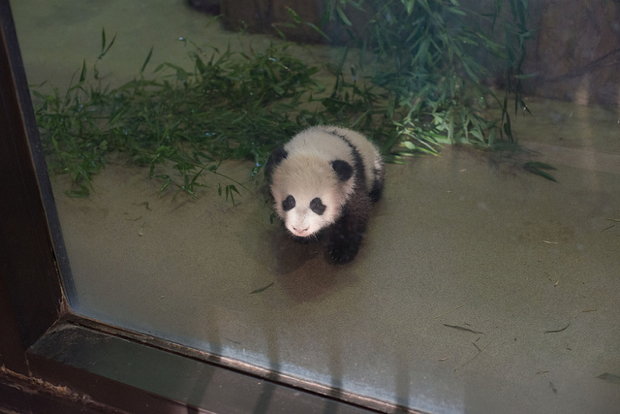 Members of Friends of the National Zoo will get advance looks at the panda starting January 11. Memberships for the group start at $50, but that seems like a lot to pay to look at a panda that will be free a week later.